CLSC Selections & March-releases Deaf Republic and Rising are now both in stock! Read more about CLSC Selections & March-releases Deaf Republic and Rising are now both in stock! “...Creating new memories stretches out psychological time, and lengthens our perception of our lives." Don't forget -- daylight saving time begins this Sunday. Gain some psychological time back by stretching your legs, taking a trip to the bookstore, and discovering a new book. Read something new! Step into the mind of someone else! Pick up a new skill! Did you know there are Housing Scholarships for first-time attendees of Chautauqua Writers' Center workshops? Click here for the full scholarship details and to submit your application, or here for more information on the 2019 Writers' Center programs. Winners of this scholarship will participate in 2-3 weeks of Monday-Friday workshops, supported by free dormitory housing (shared with one roommate), a free 21-meal plan for the week, and a steep gate pass discount. Applications are accepted through April 30, 2019. Read more about Hark ye, Writers! Today [Feb 20], on the one hundred and twenty-forth anniversary of the death of Frederick Douglass, the CLSC has announced the latest 2019 CLSC Selection -- Frederick Douglass: Prophet of Freedom by David Blight. As a young man Frederick Douglass (1818–1895) escaped from slavery in Baltimore, Maryland and he would go on to become one of the major literary figures of his time. He wrote three versions of his autobiography over the course of his lifetime and published his own newspaper. His very existence gave the lie to slave owners: with dignity and great intelligence he bore witness to the brutality of slavery. In this remarkable biography, David Blight has drawn on new information held in a private collection that few other historian have consulted, as well as recently discovered issues of Douglass’s newspapers. Blight is a professor and director of the Gilder Lehrman Center for the Study of Slavery, Resistance, and Abolition at Yale University. In addition to numerous other publications, he is the author of Race and Reunion: The Civil War in American Memory, which received eight book awards, including the Bancroft Prize, the Abraham Lincoln Prize, and the Frederick Douglass Prize. The CLSC Presentation will take place Thursday July 4th, 2019 at the Hall of Philosophy. Tip: Link Our Store On Goodreads! 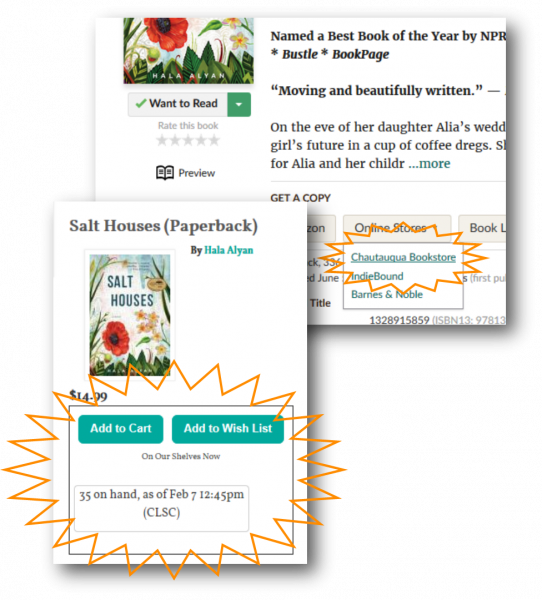 Do you use Goodreads to keep track of books you want to read? Take a minute to add Chautauqua Bookstore to your preferred Online Stores list so you can always easily check if we have the book you want in stock at our location, or place to an order. Read more about Tip: Link Our Store On Goodreads! This year's American Library Association Youth Media Awards, including the Newbery, Caldecott, Printz, and Coretta Scott King Book Awards, have just been announced. Check out some of the winners and honorees below! Feed two birds with one seed: when the snow keeps you inside, keep yourself busy today and warm tomorrow with knitting and textile arts! “Ford carried on counting quietly. This is about the most aggressive thing you can do to a computer..."
Please be aware we will be (mostly) closed Monday January 21st, 22nd, and part of the 23rd for our annual Inventory. Newspapers will be available by reservation or cash sales, but the rest of our store's offerings will not be available for purchase or browsing. Read more about “Ford carried on counting quietly. This is about the most aggressive thing you can do to a computer..."
The New Year is here! What's your resolution?